Lawmar. Yamamoto managed to get away from being charged a criminal offense after he received so many criticism from other politicians over his handing his letter to the Emperor. He was just talked over to resign his position as a member of Lower House by Mr. Iawaki, a head of 参議院委員会. He showed no sign of resigning... even if he gets continuous harassment by his opponents, pro-nuclear group including being threatened to be killed and sent a knife by post. Mr. Yamamoto recently acquired some information on the exporting of nuclear business to Vietnam. However, the document is nearly painted all black. 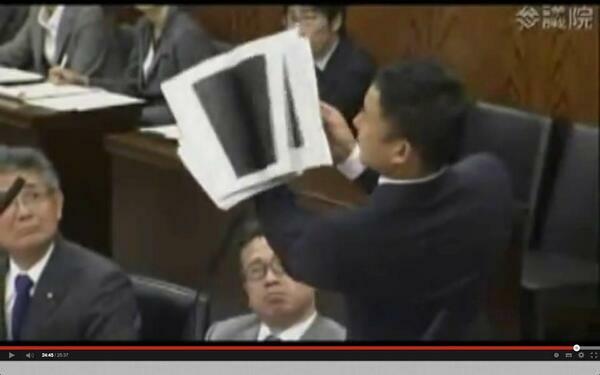 He shared the redacted blacked out document with the rest of members of the Parliament. "It is all painted black! Doesn't this document show we are already affected by new secrete law!!"